I am going to post some basic tutorials on how to use virtual dub and fraps together. 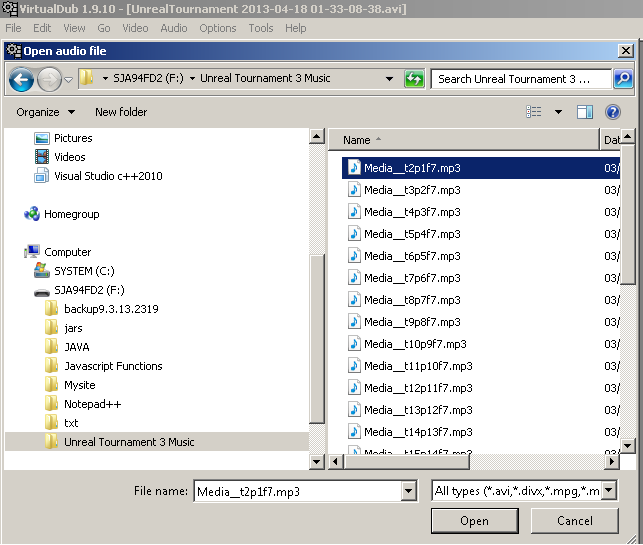 4.Virtual Dub: Adding Clips/ other video files. If you do not have a copy of fraps you can get it hereDownload Fraps 3.5.99 free version. 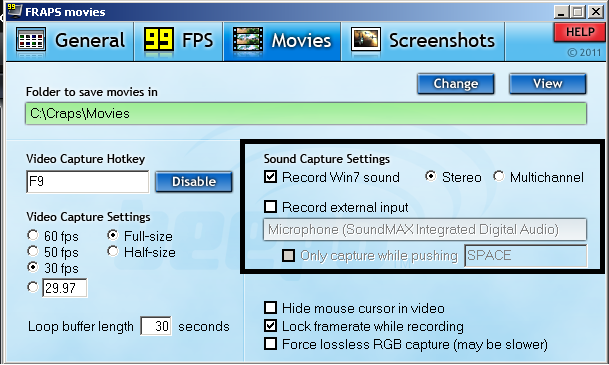 In fraps you have a few audio setting you can use, for example if you want to record your microphone only instead of the windows audio, you can tick the box "Record external output", and untick "record Win7 sound". To record Windows sounds, only tick record Win7 sound. To record Windows sounds and microphone, tick both boxes. Select the Audio drop down menu. Click on "Audio from other file". Now when you play your video it will use the Audio file's sound instead of the original video's audio. Here is some basic tips so the audio doesn't become crackly or poor quality. Make sure not to have Windows Volume on 100%, if its to high it can make the sounds quality poor and crackly, try something around 20-50%. Have the unreal tournament Sound slider around the middle of the bar, same with the music bar if you are using it. If you want the announcer volume to be easy to hear you can use the bar all the way to the right of the bar. Having the sound bar in the middle gives you the options, of having the music higher in your video, same with the announcer, so you can hear it better. This is just a basic tutorial of how to convert the file fraps creates, and convert it so it has decent quality and is not 40gb in size. The first thing to do is to open the video file from the fraps movie folder, click FILE -> Open video file... then select the video file of your choice. After you have done this we can change the video compression settings, click VIDEO -> compression -> and select Xvid MPEG-4 Codec. You can change the configure settings if you want, but for this tutorial the default settings should be fine. Now all you have to do is save the file, FILE -> Save as AVI... then all you do is wait for it to process the file, and now the files size should be much smaller. If you would like to speed up your video or slow it down, this is what you will have to do. Select the Video drop down menu, and select "Frame rate...". Now Select "Change Frame rate to (fps)" Radio button. If you want to speed your video up enter in a number >30 in the text field, or to slow your video down enter in a number <30. One thing I should mention is, it's best to use Audio from another file or no audio at all when doing this. here is what 5 fps looks like. How to Delete parts from your video. There is two buttons you can use to select a frame as a starting point, and the other to select the ending frame. First thing you should do is move the slider along to the frame you want to start at and then click the left button of the two(see above), then move the slider to the last frame you want to delete and press the right button(see above). you should see that the slider is now highlighted the part you want to edit(see below), now press delete and it should remove the clip from your video. Click on "Append AVI segment". Select the video file you would like to add, click open, now the video you just added will be added to the ending of your first video. // I will finish this bit soon. I will do some more tomorrow and add to this one. Please post stuff below you want me to do. Last edited by UT-Sniper-SJA94; 04-21-2013 at 12:14 PM. Wow! Gotta try this out, and I indeed dislike fraps being such a hugh file maker that hog up the hard drive spaces! TY! Virtual dub: using music instead of video audio. 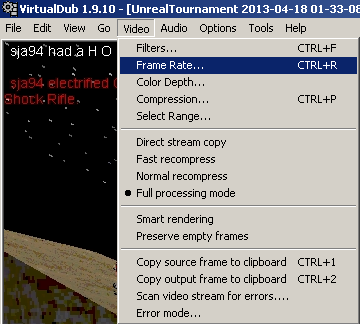 Virtual dub: Frame rate/ Slowing down your video. Virtual dub: Compressing further and other settings. Virtual Dub: inserting and removing clips from your video. Last edited by UT-Sniper-SJA94; 03-07-2013 at 09:57 AM. FFDShow CoDec can install a plugin for VirtualDub, and will give you access to many filter and output options (including XviD and DivX). Gspot CoDec information appliance (useful tool, can be used to change the preferred order of CoDecs). Useful screencapture and lossless CoDecs. Plus some of the best filters for fixing/cleaning video. General tip for high-quality encoding in a smaller size. Use AVC 2-pass encoding. Yeah it takes longer, but the quality difference is stunning. Most MP4 derivatives such as DivX, XviD, Matroska and all H.264 variants are capable of it. The ultimate convert anything to anything program has to be "Super" from eRightSoft. I find some of the CoDecs can be a bit old, but it can be manually upgraded (with the help of Gspot) by those that know what they are doing. But this is still a very good tutorial! Thanks mate!